I couldn't wait and I'm pleased with the job I did. I was doing 2011 photo's on my layouts this year as I wanted to try to keep on top of things but with such an amazing subject how could I resist. I did this layout with a picture of Charlie (you know my grand son) that his Aunty Sarah took of him. She has taken some awesome photo's and this one I love cause he's smiling. 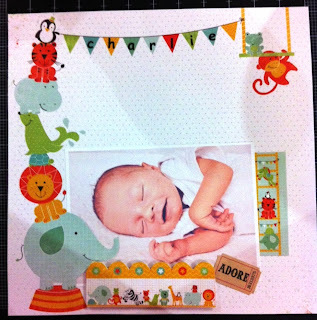 I used Kaisercraft Party Animals Collection paper for this and it's so perfect as he has a animal theme bedroom. I also did this layout which was not 2011 but Christmas 2010 so it was nearly 2011. The photo was take at Donna my sisters house on Christmas day 2010 and it was a setup to compare with the 1992 one on the bottom of the layout. When the kids were young they were together all the time. Unfortunately as the years have gone they don't see each other nearly as much. Nawww he is the cutest little baby ever little Charlie ... such a happy content little boy. Great layout of the four cousins ... love that you have them sitting similarly ... love that idea!